While most studies on Jesus' final week spend most of their efforts laying out the events of Jesus' final days, this DVD study goes one step further to teach you and your small group or church the deeper connections that are rooted in the New Testament's first century context and branch out into the twenty-first century applications. Last Days Of Jesus, The: DVD Study by Williams, Matt was published by Rose Publishing in January 2017 and is our 8526th best seller. 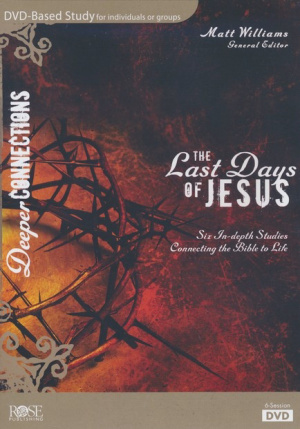 The ISBN for Last Days Of Jesus, The: DVD Study is 9781628624328. Be the first to review Last Days Of Jesus, The: DVD Study! Got a question? No problem! Just click here to ask us about Last Days Of Jesus, The: DVD Study.